Yup, I wore GREEN! What a unique experience at the Children with Diabetes Friends for Life Conference, 2016! 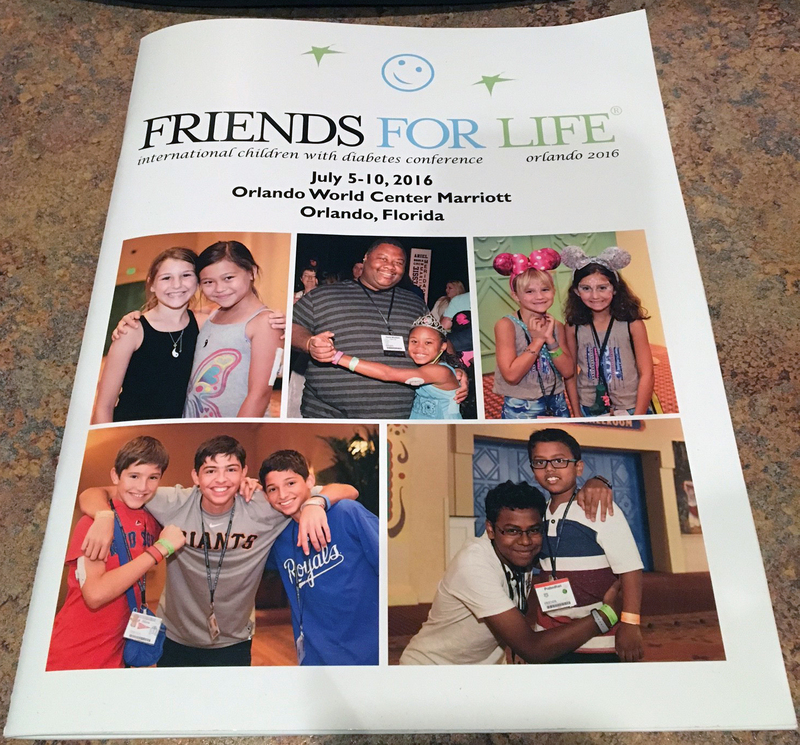 After I had the good fortune to attend Diabetes Hands Foundation’s MasterLab 2016, I was able to take in the programs at the Friends for Life International Children with Diabetes Conference 2016, held at the same Orlando World Center Marriott. And OH, what an amazing conference with an extensive exhibit hall, fantastic speakers, programs for all ages (Moms, Dads, Single Parents, Adults with T1, Significant Others, Grandparents, Childcare, Tweens and Teens, College kids, Siblings) and all topics … and conference attendees who were all so happy to be there. Wow! As I was registering, under press privileges, I was given a GREEN wrist band, to wear for the duration of the conference. When I asked why I had a GREEN band and others had an ORANGE band, I was told: GREEN is for the PWD (Person with Diabetes) and ORANGE is for Others (non-diabetic, perhaps parents, grandparents or siblings of the PWD). INTERESTING! I have never been obviously identified, except that I have always worn a medical ID bracelet. But I never felt that I stood out, so loudly, as DIABETIC. My first thought: I don’t like to be so publicly identified. Suddenly, here I was, a GREEN! Everyone could tell. Then I started looking around … and noticing GREENs and ORANGEs. If I saw a GREEN, I inwardly felt a kinship. When I saw an ORANGE (and there were many more ORANGES), I thought, how nice that all these people were here to support and learn about life as a GREEN. I even saw an amazing group of siblings called Orange Team Siblings. I’m sure that there are significant issues between T1s and their siblings (special diets, sick days, more attention, arguing parents and more). How wonderful that these ORANGEs care to come, learn, support their GREEN sister or brother and make friends with other ORANGEs who understand how they feel. I even spoke to one family who have been coming to these conferences for years. They said that the ORANGE daughter loves this annual event so much, even more than their GREEN daughter. What a remarkable and heartening event. If you ever have a chance to attend a Friends for Life conference, GO! Wear your GREEN or ORANGE wristband proudly. And feel the joy and love throughout the days and the sessions. Now for a bit of information about Children with Diabetes and Friends for Life. As stated on their website (www.childrenwithdiabetes.com), “the mission of Children with Diabetes, Inc. is to promote understanding of the care and treatment of diabetes, especially in children; to increase awareness of the need for unrestricted diabetes care for children at school and daycare; to support families living with diabetes; and to promote understanding of research into a cure. Being diagnosed with diabetes is a life-changing event, and raising a child is an exciting and ongoing challenge made even more demanding when managing a chronic illness. Jeff Hitchcock, founder and president, began Children with Diabetes in 1995 in response to his daughter Marissa’s diabetes diagnosis at the age of two. The idea was — and continues to be — to share experiences with other families, so that together, we can all make a difference in the lives of everyone living with type 1 diabetes. Thank you, Jeff, for allowing me to be part of this extraordinary happening! Wise words from a poet born 444 years ago explain why we gather here in Orlando every July to share, to learn, to comfort, to laugh, to cry, to renew, and to replenish – because we cannot do this alone. If you wear a GREEN bracelet, your very life rests upon the shoulders of giants, beginning with Banting, Best, Macleod, and Collip, flowing through the decades of discovery, innovation, and toil that has given us the amazing medicines and devices and doctors and nurses of today. If you wear an ORANGE bracelet, your heart is filled with joy because of those very same giants and you are called upon to be the outstretched hand in moments of need and to offer comfort in the face of obstacles seemingly insurmountable. Together, we make each other better, smarter, and happier. Together, we push ourselves to tackle challenges and to never settle. Together, we discover new ways to savor every day, knowing that even better days lie ahead. To my GREEN and ORANGE bracelet family, I welcome you to our little island of joy, our Friends for Life.